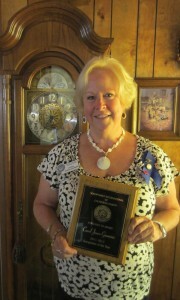 Soroptimist International of Calaveras County has chosen its Soroptimist of the Year for 2012/13. Let me introduce Chyrl Hillis, who has been a member of SICC for the past nine years. Chyrl began her Soroptimist membership in SI Calistoga in 1987 (when she and her husband, Bob, lived there). She was a member there for 17 years. “It Takes A Team” was a recent theme of past Co-Presidents Paulette Stelte and Beverly Stewart. Chyrl lives up to that theme and gives 200% in all that she does. Her Soroptimist membership is at the very top of her list. Fund-raising is a priority for this long-time member and she was very active when this club did Festival of Trees some years back. She has worked on Teddy Bear Tea in every aspect including sharing the day with her granddaughter, Sydney – now 10 years old – who has attended for the past 5 years. Chairs for Charity, another of SICC’s fundraisers, is dear to her heart and the event has become more successful, in no small part, due to Chyrl’s many hours of work, dedication & organization. Chyrl, and her team, have cooked their own special chili as two of our past Chili Cook offs events also. When the Youth Parade rolls around in mid-May, Chyrl will be found knee-deep in keeping that event on the right track. Over the years, Chyrl has held most every office, including President, and has served on almost every committee. For the past several years, she has held the position of Treasurer. This position is the backbone of our club and she has spent countless hours devoted to balancing and accounting for every penny! If it hasn’t been a good day balancing the books, you might find her being a little “SNARKY”, but that soon passes! — but the 3rd time! Being chosen as Soroptimist of the Year is a very BIG DEAL! 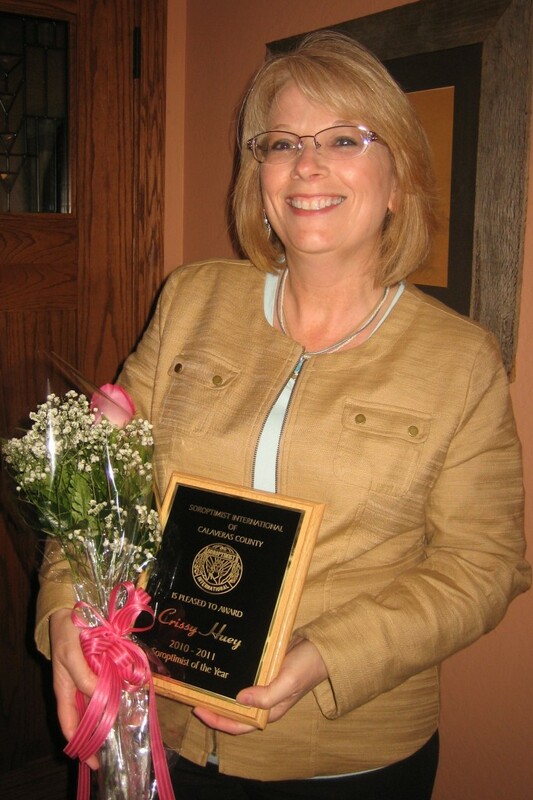 Carol Jones-Giannini epitomizes just what members see a true Soroptimist being. She helps on all projects and is always there with her creative talents to create a centerpiece, decorate a raffle basket or add just the final, perfect touch! Carol gives without reservation and her “can-do” attitude shines through in every project she is involved with. She attends committee meetings and does not hesitate to suggest new ideas or approaches. Loaded with many varied talents and skills, she is humble and shares the limelight with her fellow club members unselfishly. Positiveness is another of Carol’s attributes that endears her to our fellow Soroptimists. Her varied past business endeavors has put her in touch with many, many different residents in Calaveras County and beyond. This is a handy thing to know when sponsorship dollars are being sought. Multi-tasking – you bet! 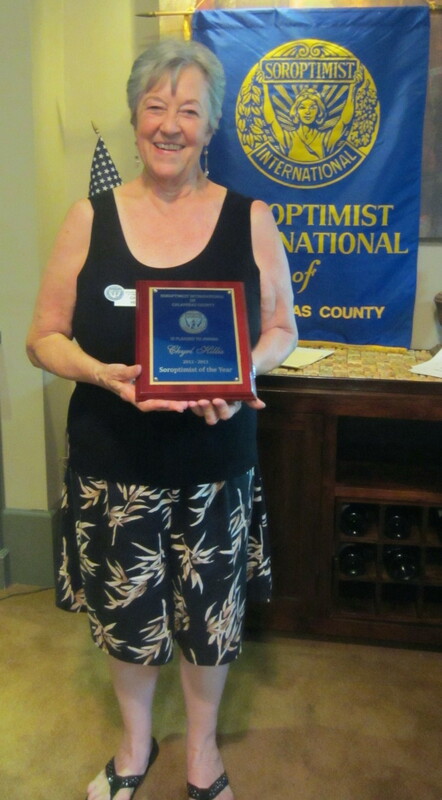 Carol is not only instrumental within our club, but volunteers at the Murphy’s Senior Center where she is a coordinator. She seems to juggle these many activities and family responsibilities – and always greets others with a smile in spite of the many things on her plate! Carol has accepted the challenge of our major fund-raiser, the Teddy Bear Tea, for the past few years. A recent change of venue for Teddy Bear Tea presented new and different challenges — Carol took all those in her stride and the event has grown in popularity since. She creates a different feel for each year and seeing those children with big smiles on their faces makes all the effort worthwhile! Balancing her membership and chairmanship duties with family health challenges this past year, left us all in awe of her stamina & courage as a woman, wife, mother and daughter. 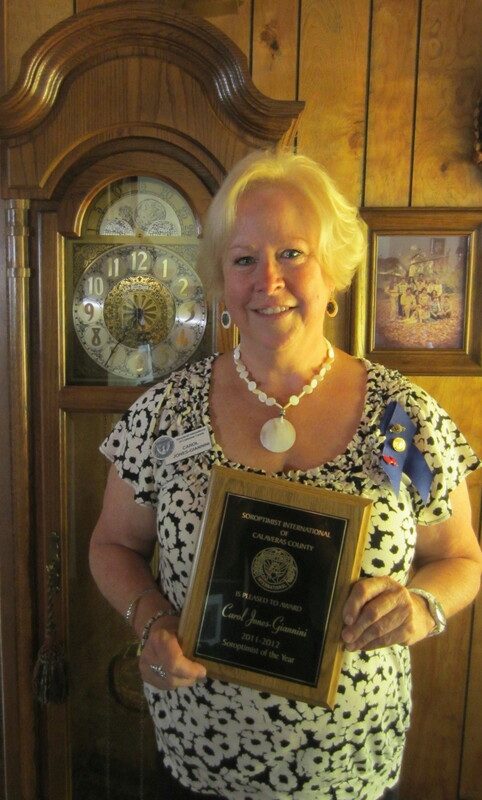 Helping hands – a great positive attitude – and contagious energy –these are the things that members look for in choosing — SICC’s Soroptimist of the Year, Carol Jones-Giannini! Crissy Huey of Angels Camp was honored June 1, 2011 as Soroptimist International of Calaveras County’s 2010-2011 Soroptimist of the Year, during the club’s June meeting and Installation of new officers ceremony. As a new member (joining the club last June) Huey “jumped right in and gave it her all”. She has been involved in a wide variety of activities and fund-raisers: Desserts & Dancing (what a luscious display of desserts she created), Chairs for Charity – her Pampering Basket garnered the most raffle tickets, she co-chaired the Chili Cook-off, was involved with planning the District III meeting, Teddy Bear Tea … and the list goes on and on!